Scratch Factory: Tiny Terrors Comes To Life! Tiny Terrors Comes To Life! Tiny Terrors is a brand-new d20 mini-game that lets players take on the Boogeyman and other fears of childhood, fighting for innocence and childhood spirit as living toys, sworn to defend their owner against the REAL monsters under the bed. The forces of nightmare are on the march, targetting children all over the world, lurking under beds and in dark closets, down in the basement and up in the attic, hungry for the innocence of their prey. The only thing that stands between the minions of the Boogeyman and his helpless victims are toys, righteous defenders of innocence. Action figures, construction kits, stuffed animals and even security blankets rise to answer the call to duty, taking on the Boogeyman and foiling his sinister schemes. 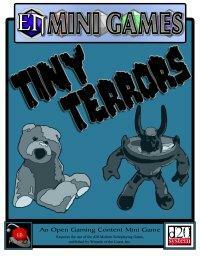 Tiny Terrors lets you take up the role of these stalwart defenders and join the fight. With feats like Kung-Fu Grip and Die-Cast Construction, new advanced classes like Dog Rider, Collectible and Haunted Toy, and all-new monsters and abilities, Tiny Terrors proves that small scale means big fun. Yes, sir. Who doesn't want to play a security blanket? Come on. The game is based on d20 Modern, with all-new races, basic classes, advanced classes and all the usual goodies: new feats, new skills, new monsters, new fun. You're gonna love it. You know you will. Am I ever wrong about these things? What's Going On In That Country?